Maureen was a student at the 2017 British Institute. She recently got in touch with Fiona, to thank her for the work they had done, and how it has helped her break down a brick wall that had stumped her family for more than two decades. For more than 30 years, we have been stymied in our attempts to find the Irish origins of our 2X Great-grandparents, Owen and Margaret (Stokes) Clerken. One might think that their five sons, arriving in America circa 1850, would have left ample evidence of their origins. Not so. The first generation of researchers* drove to county courthouses in Iowa and LDS archives in Utah. The next generation flew to Ireland, consulting with Theo McMahon in Co. Monaghan. Our generation ordered DNA test kits and attended the 2015 and 2017 British Institute in Salt Lake City where experts Fiona Fitzsimons and Maurice Gleeson cast experienced eyes on our conundrum. At long last the answer has emerged, announced not with bells and whistles but with slowly mounting evidence. This tale may prove helpful and hopeful to others who have reached the last station on the train line only to find themselves a good distance from their final destination. Documentary Evidence: What did we know and how do we know it? In the decades of this quest, several of the original researchers have died, but not before leaving a legacy of solid data, high standards and insatiable curiosity. The 1930 U.S. census records of two sons (Thomas and Henry) identify “Irish Free State” as their birthplace. This tiny retrospective clue, easily overlooked, excludes the six northern counties. Obituaries of two sons (John and Francis) state “Co. Monaghan” as their birthplace. The faded 1851 Irish marriage record of son William Clerken lists “Aghabog Parish” as his residence and “Kilmore Parish” as his bride’s residence. These documents clearly establish Co. Monaghan as the home of the Clerkens, and the marriage record strongly suggests their birthplace to be Aghabog parish. But there’s more. William’s bride was from Kilmore parish. When his own two feet were the only means of transportation, William had to reside close enough to Kilmore to permit a walking romance. This fact places the Clerken home on the far eastern side of Aghabog parish, adjacent to Kilmore parish. Corduff-Corrinewey-Kilmore East townlands on the Aghabog-Ematris parish border. The given names of 1833 landholders provide further clues. In the Corravilla-Drumlinny location, “William” appears as the Stokes given name. This is intriguing because two of the Clarken immigrant sons have distinctly unusual Catholic given names - William and Henry are far more common in Monaghan as Protestant names. So how did the Catholic Clarkens receive such names? In pursuing “William Stokes” of Drumlinny, we learn from his burial records that he was Protestant Church of Ireland. When we theorize that he is the father of our Margaret (Stokes) Clerken, we solve two problems: How our Margaret Stokes met Owen Clerken (she lived next door), and her strategy in naming their children (their namesakes recognized both Protestant Stokes ancestors and Catholic Clerken ancestors). By the 1858-60 Griffith’s Valuations, Stokes surnames have disappeared altogether from Co. Monaghan, and the Owen Clerken name has disappeared from our two favored locations. From a research standpoint, is this good or bad? It is indeed consistent with the massive depopulation of Co. Monaghan due to the Famine, and it is consistent with the family lore that Owen and Margaret died in Ireland before their sons immigrated. We have now arrived at the last station on the documentary railroad. It is thoroughly discouraging to disembark at Aghabog parish in Co. Monaghan, carrying only theories about whether Corravilla-Drumlinny is our final destination. In the last several years, DNA has extended the railroad into more remote regions. At least 20 of Owen and Margaret (Stokes) Clarken’s descendants have pounded their spikes into the DNA rails. A few months ago, “PCS” emerged as a 4th- 6th cousin DNA match to some of these descendants. PCS’s genealogy firmly plants his Kierans/Kearns/Currans ancestors in Rossnaglogh East, immediately adjacent to Corravilla. But Kierans is a vexingly common surname in these parts. Thus far we have been unable to uncover the MRCA, who likely lived before 1800. More recently, “KSG” appeared as a 3rd- 5th cousin DNA match to some known descendants, delivering an impressive 35cM longest segment. Although we have yet to find the MRCA, KSG’s genealogy specifically plants his Gavin ancestors in Nart. 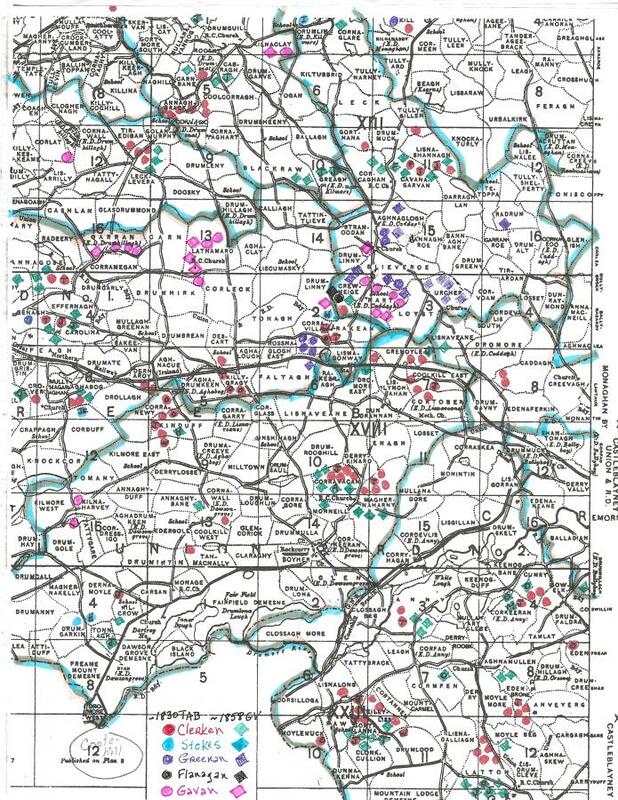 Moreover, his ancestral surnames of Gavin, Flanagan and Greenan are decidedly uncommon in Monaghan, but they are numerous in the townlands of Nart, Crewmeige, and Corravilla. When plotted on our color-coded map of this area, these surnames arc over our Clarken-Stokes surnames like a rainbow. Although we cannot unequivocally state that our Clarken-Stokes ancestors were from Corravilla-Drumlinny, very strong circumstantial evidence now places them there. We are finally content to call Corravilla-Drumlinny the likely historic townlands of our family. It’s a relief, long in coming. What are the general lessons from this? First, in tough cases, evidence builds over time. As it builds, it focuses our attention more narrowly, improving our efficiency. Second, rigorous scrutiny of all information eliminates misleading data and yields clues that escape cursory notice. Third, physical tools, such as color-coded maps, allow the data to speak -- or in this case -- to shout. Finally, more data sources and more effective technologies continually emerge. Even as our documentary evidence grew over the past years of researching civil and church documents, the DNA evidence and our ability to analyze it will grow in the coming years. Somewhere out there, someone exists with an indisputable family tree and a DNA profile that will clinch the case. *We are indebted to deceased researchers Ellen Svejda, Pat Whipple, Ed Kelly, Ruth Clarkin, and the very much alive John D. Clarkin, who initiated this quest so many years ago. Their careful work laid the foundation on which the additional evidence was discovered. 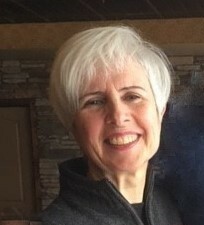 Maureen K. Reed is an educator at the University of Minnesota. She is a medical doctor, the former Executive Director of the Nobel Peace Prize Forum, and a former chair of the University of Minnesota Board of Regents. Her interest in genealogy was fostered by her father’s dinner table stories. She continues to pursue the goal of identifying the townlands of origin of her eight Irish great-grandparents. Just one remains to be discovered.